On Sunday, the weather was dry, sunny and perfect for a ride on the bike. We set out early, to make the most of quieter roads and avoid the unbearable midday heat and set off into deepest Essex. This was Evie’s first proper ride out, having only been on short journey’s around local streets to get used to riding pillion. Decked out in a Hein Gericke textile suit with armour, RST boots and Caberg lid, she was more than prepared. 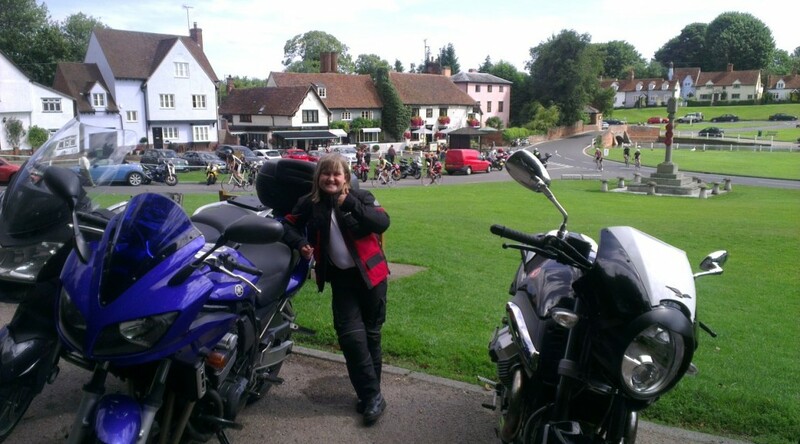 We briefly stopped at the High Beach tea hut, but got bored waiting for it to open so dashed off straight to Finchingfield, via Ongar, Leaden Roding and Great Dunmow, a popular run for all bikers. Evie was a good pillion, quickly got the hang of leaning with me around all the twisty bends. Just a bit wobbly as she was looking around lots. In Finchingfield we popped into the Bosworth’s Tea Rooms for a quite bacon buttie and coffee, Evie had a sausage sarnie and juice. Very nice and far better espresso than High Beach. Fed and watered we set off home and were back for noon. There’s definitely plenty of good arguments for an early Sunday morning ride out.